SCREEN STRETCHING MACHINE-FABRIC STRETCHING MACHINE FOR QUALITY PRINTING. IMPROVE THE QUALITY OF YOUR PRINTING WITHOUT ANY INCERASE IN RECURING COSTS ! Stretch machine is An integrated instructional placard shows you eight essential stretches to target key muscle groups – lower back, hamstrings, gluteal/hips, hips/legs/back, inner thighs/groin, upper back, shoulders and quadriceps. The die and forming device The hydraulic power pack to operate the die The Die : The die consists of an expanding mandrel operated by two built in hydraulic cylinders which forms circular can into the square form. 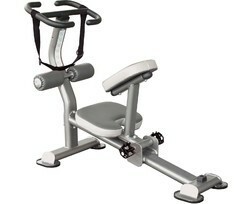 Leveraging over the skills of our qualified team of professionals, we are engaged in providing Precor Stretch Trainer. This Machine enables bolting cloth used in the manufacture of Printing Screen is stretched applying uniform tension and parallelism in warp and weft sides i.e. towards all the four directions as each one of the clamps holding the bolting cloth are fed separately with compressed air.